When the alternative metal band System of a Down went on what turned out to be a semi-permanent hiatus in 2006, I was mighty disappointed. The band had released several albums full of outstanding material, with songs like Lonely Day, B.Y.O.B, and the Rock Band favorite, Chop Suey. Since, the four band members have gone to work on various solo projects. And ever since, there are rumors that this might be the year that SOAD will reunite. "Every few months I am honored to hear interesting rumors about whether the band is going to tour or break up permanently," said Serj Tankian in a 2009 interview. "I find them all to be very entertaining." Tankian had already been doing well on his own. He played most of the instruments (with a little help from his friends) in his first solo album, the brilliant Elect the Dead. 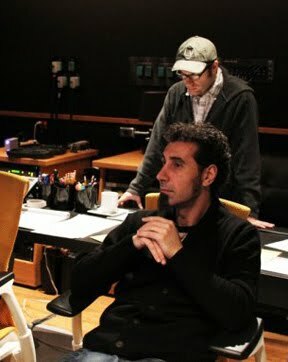 As of late, Tankian has been busy recording, producing and mixing his next solo outing, Imperfect Harmonies, which is slated for release on his own Serjical Strike label in September of this year. The big news for SOAD and Tankian fans is that the first single from Imperfect Harmonies, called Left of Center, is already out. It's a powerful song filled with the political, philosophical, and social concerns that have always characterized Tankian’s work alone and with SOAD. Urgency? Check. Frustration? Check. Heartbreak? Check. His voice here is anything but imperfect — it’s strong, booming, pleading, and striking. Tankian just gets better and better. While this review is focused dead center on Left of Center, Tankian is still being gracious to his fans. In addition to Left of Center, he is treating fans to a lyric video of his second song from Imperfect Harmonies to be released in September. So don't stop with Left of Center. His YouTube channel tells you how to download this song for free. If you like Borders Are, all you have to do is sign up to be on his mailing list. Then, click the download link in the confirmation email you'll receive. There is some great buzz about Imperfect Harmonies already, and this could very well be Tankian’s strongest work to date. Expect more soon. He is embarking on a summer tour of Finland, Sweden, Denmark, Germany, and Canada and then lands in the U.S. for the American leg of his journey, starting in San Francisco on Sept. 17. Serj Tankian's Left Of Center Rings Loud With A 9.2 On The Liquid Hip Richter Scale. With two songs out, there isn't much to second guess about Imperfect Harmonies and I'm already looking to give the entire album a listen soon. Never mind the more critical customer reviews about Left of Center on iTunes. There is some concern that the longer SOAD members see success on their own, the more difficult it will be to get back together. Left Of Center is also available on Amazon. Tankian's Website is currently being developed to include dozens of improvements and an expansive community section.